Some websites and applications embed hidden fields within web pages to hack and pass state information between the web server and the browser. Hidden fields are represented in a web form as <input type=”hidden”>. To see the source code in Internet Explorer, choose Page→View Source. In Firefox, choose View→Page Source. For example, a malicious user might change the price from $100 to $10. Repost the page back to the server. Using hidden fields for authentication (login) mechanisms can be especially dangerous. You could come across a multifactor authentication intruder lockout process that relies on a hidden field to track the number of times the user attempted to log in. This variable could be reset to zero for each login attempt and thus facilitate a scripted dictionary or brute-force login attack. 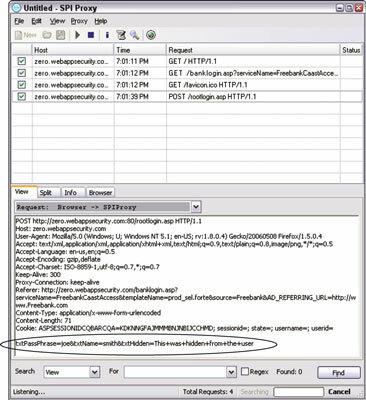 Several tools, such as web Proxy (which comes with webInspect) or Paros Proxy, can easily manipulate hidden fields. If you come across hidden fields, you can try to manipulate them to see what can be done. It’s as simple as that.